A nagging hip injury wreaked havoc on his game last season, but Tim Thomas has shown the NHL's top shooters he has zero tolerance when it comes to letting in goals. You really can't keep me a good man down. In this instance, it's one of the most personable goaltenders in hockey today, a player who has undoubtedly had his fair share of ups and downs over his career. But just when people begin doubting Thomas, the Boston Bruins' backstopper comes back seemingly better than before. After winning the Vezina Trophy as the league's best goaltender in 2008-09, Thomas struggled in 2009-10 to show the form that led to his first major NHL trophy, when he won 17 games against 18 losses. The native of Davison, Michigan underwent off-season surgery to repair his hip labrum, leading to a tough round of rehabilitation and little guarantee that he'd be the No. 1 starter in 2010-11. So, how did he respond to all the questions about his game? Thomas won each of his six starts in October and became the first Bruins goaltender to start the season 6-0-0 since Hockey Hall of Famer Cecil 'Tiny' Thompson in 1937-38. Highlights of the month included 73 saves in two wins over Washington and back-to-back shutout victories over Ottawa and Toronto, which helped him capture the NHL's First Star of the Week for the week ending October 31. Not bad for a guy who played for several years in the minor leagues and Europe before emerging as a star on hockey's elite stage. For Thomas, it's not about proving people wrong, it's about backing up the belief he's always had in himself. He also got the chance to live his childhood dream when he was selected to play for Team USA at the 2010 Winter Olympics in Vancouver, where he won a silver medal. Regardless of where he's played, Thomas has made his mark. Early in the 2008–09 season, he became the first Bruins goalie to record back-to-back shutouts since Byron Dafoe in 1999, winning 1-0 games against the Edmonton Oilers on October 27, 2008 and the Vancouver Canucks on October 28. His overall shutout streak came to end the next game at 154:43 minutes in against the Calgary Flames on October 30. He was chosen to play in his second All-Star Game in 2009, and was once again the winning goaltender for the Eastern Conference, beating the Western Conference 12–11 in a shootout (the first time the All-Star Game required the tie-breaker since 2005). A month later, on February 26, 2009, Thomas recorded his 100th NHL win, in a 6–0 shutout against Anaheim Ducks. 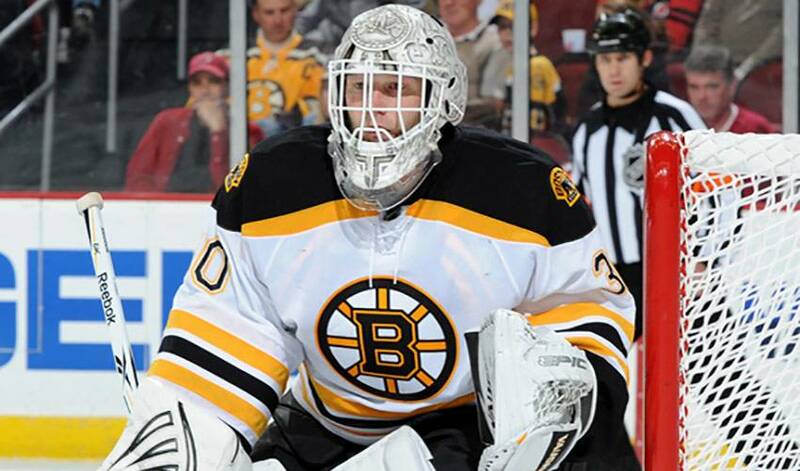 On April 2, 2009 Thomas agreed to a four-year contract extension with the Bruins, through to the 2012–13 season. Two days later, he posted his career-high fifth shutout of the season in a 1–0 win against the New York Rangers, clinching top spot in the Eastern Conference, Boston's first title since 2001–02. His strong play allowed the Bruins to sweep the Montreal Canadiens in the first round of the 2009 Stanley Cup Playoffs, but the Bruins bowed out to the Carolina Hurricanes in seven games the following round. On June 18, 2009, Thomas was awarded the Vezina Trophy at the NHL awards, besting Minnesota Wild netminder Niklas Bäckström and the Blue Jackets' rookie goaltender Steve Mason. He led the NHL with a 2.10 goals-against average and .933 save percentage. And now, Thomas, who looked to be on the ropes following a tough 2009-10 campaign, is back at the top of his game. The man known as ‘The Tank' just wants to keep on rolling.